Sliquid announced today their new marketing and educational campaign, ‘Sliquid 101’. The Sliquid 101 campaign was born out of the various questions Sliquid’s customer service team receives on a daily basis. The questions range from, ‘What is the difference in water-based and silicone products?,’ to more complex questions, such as ‘I have multiple sensitivities, so which is which going to work best for me?’ For this reason, Sliquid has taken their product education directly to the consumer in an accessible, streamlined Quiz. “Our marketing and sales team have put together something truly original for our customers and vendors to enjoy. It’s not all fun and games though. Sliquid 101 is real-time product education, for all consumers who are conscious of buying a product that is going to work for them and address their specific need(s). I am excited to see our brand grow, not just in product SKUs, sales, and employees, but also in ideas and concepts that come to fruition through the creative and innovative minds behind this Sliquid 101 campaign. I am very proud of the entire Sliquid team for all their hard work on this campaign,” said Dean Elliott, Sliquid CEO. The Sliquid 101 campaign’s main component is an interactive Quiz, which is available starting today at https://sliquid.com/sliquid-101/. The quiz consists of five questions that calculate a result based on the answers provided, which will land the customer on a page containing pertinent information about the recommended Sliquid product they should use and why exactly they have been directed to that particular product. As part of this learning experience, Sliquid has produced original videos featuring Sliquid expert Michelle Marcus, to convey the information in a more direct, clear, and personalized way. The video content offers the viewer the foundational knowledge as to what they should be using, then links them to the site to learn more about the product, as well as to purchase if they wish. Viewers can add a bottle of the product they land on directly to their cart without ever leaving the quiz. “The Sliquid 101 campaign is the culmination of months of work put forth by a creative team that I am unbelievably proud to be part of. Together, we have crafted a comprehensive, strategic marketing initiative that deviates from the traditional photo campaigns of yesteryear and positions Sliquid a step above the rest by offering our customers a more innovative way of connecting with our brand. When it comes to marketing, companies must think outside the box and meet their customers where they are at…and that is online. Moreover, when it comes to branding, companies must be bold and direct in their mission. For Sliquid, this meant taking product education to a digital platform, and making it accessible to our end user so that their intimate product purchases are thoughtful and educated,” said Erik Vasquez, Sliquid Marketing Director. Sliquid has also created original artwork for the campaign, which is visually reminiscent of educational learning. The chalkboard, back to school theme will be released one at a time, once a week throughout the Fall, along with information about the product. This imagery and the data will be posted on all social media platforms. With today marking the rollout of Sliquid 101, bloggers and online retailers can now request a customized, branded quiz. The branded quiz will be generated using the requester’s logo and website color scheme. The requester will then be sent a link to embed the quiz into their own website, and the landing page with the suggested product will then link back to that website’s Sliquid product page so the customer can purchase directly through their site. Should the product they land on not be available through the site, the customer can then request to have the retailer carry the product. This is a great way for Sliquid retailers to gather information from their customer base and may be helpful in identifying deficiencies in the range of lubricants they carry. Coming later this fall, Sliquid will be printing an infographic poster that can be sent to retailers for in-store use. The poster will work in the same way that the quiz does, only in a non-digital format. This will be a great tool for brick and mortar retailers to offer the Sliquid 101 experience without needing the internet. Sliquid will also be hosting online LIVE Lessons with Michelle, via Facebook, where she will be bringing in special guests to talk about lube and answer questions. During these lessons, anyone who interacts during the broadcast will be eligible to win Sliquid swag and free product. 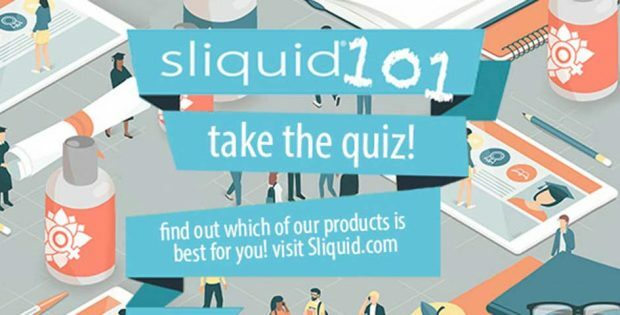 Online retailers and bloggers can request their customized Sliquid 101 quiz by visiting https://sliquid.com/sliquid-101/quiz-request/.